At the beginning of the year I mentioned that I had several goals that I would be working on this year; and that I would share what they are at a later date. Well, the next few post (not including the weekly planner spreads) will discuss what they are and how I’m going to accomplish them. This week I’m going to talk about my healthy body goal. In May of 2018, I joined Weight Watchers. This happened after being a little frustrated with how my body was looking and what I wanted it to look like. Let me first tell you that in my early 20’s I did some modeling – hence I was a little person. Not little short, but little thin; I was 5’10.5” and weighed 126 lbs – I was little y’all. I got married at 28 years old still 126 lbs. I was super thin and honestly do not want to be that small again, but I want to be smaller than I am now. I’m not huge, but I’m not at my idea size and not super toned. I like to eat most healthy things, I’m not a huge snacker (because I’m too lazy most often to go get the snacks), and although I love to bake, I’m not a big sweet eater (because again I’m too lazy to go get the sweets once I’ve finally set down). My problem folks is portion control. You know how when you were young, your mother/father told you that you needed to eat everything on your plate? I haven’t let that go. So most often when I sit down to eat, I work really hard to finish everything on my plate, even though I’m full. 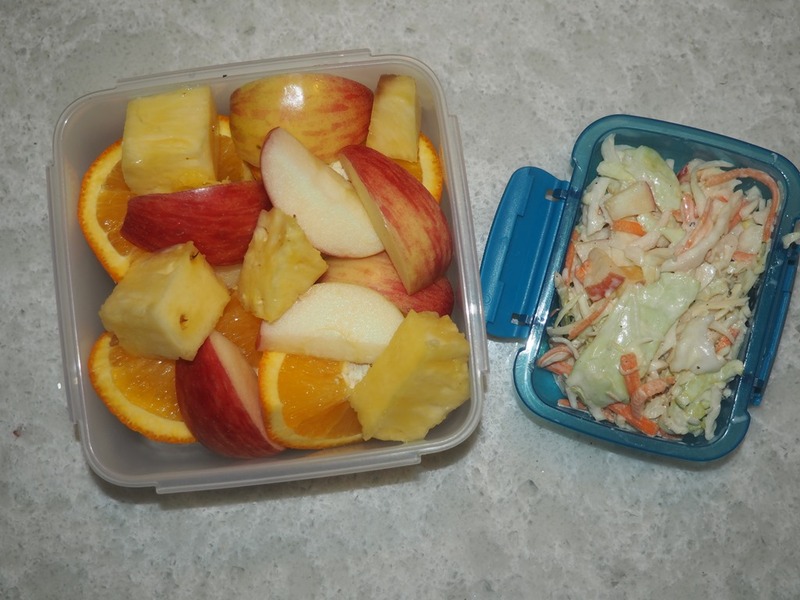 Weight Watchers was having a special at the perfect time – whatever I had on that day didn’t look as smooth as I wanted it to be and I knew it was because of my weight. I signed up for the part of the program where I do not attend the meetings but I can still track what I eat and the points I’m assigned that will help me get to my goal weight. It has really been an eye-opener. Did you know that smoothies are not point friendly? All of those “healthy” smoothies that I was drinking each morning made with pineapple, carrots, spinach and coconut water (sometimes mango, strawberries, peaches – but always with spinach and coconut water and carrots) were like half of my daily allotted points! I haven’t had a smoothie since May. I have become more conscience of what I am eating. I have learned to choose the healthier options for salad dressings or learning to have a salad without so many extras. 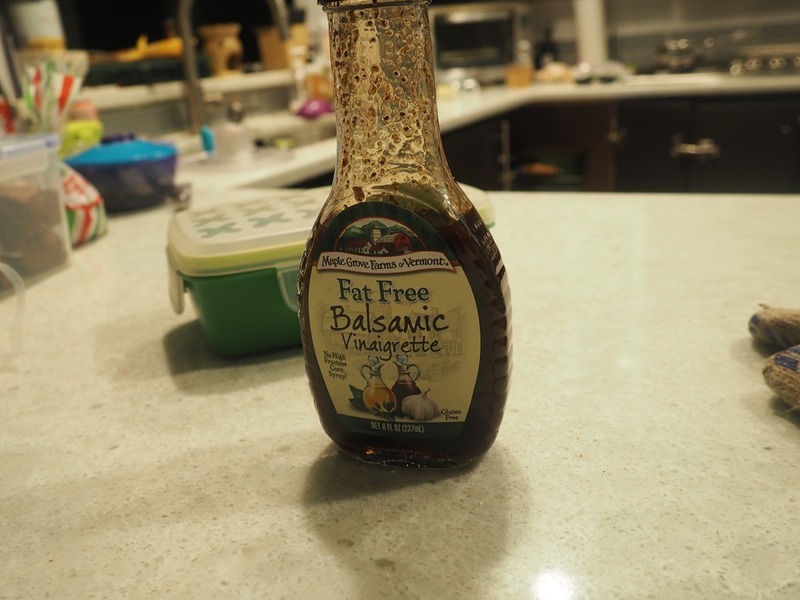 This balsamic vinaigrette I’m currently loving is this one…. I was looking in my olive oil cabinet and found a blood orange balsamic vinegar that I want to make into a vinaigrette after I finish this bottle. I now make sure my vegetable and lean protein intake covers more of my plate. I still have some of my favorites, like a homemade biscuit or slice pecan pie; now I have it less often. I have had to find new snacks when I want something crunchy. I am still learning how to use peanut butter powder instead of peanut butter – cause I really love peanut butter and I really miss it. 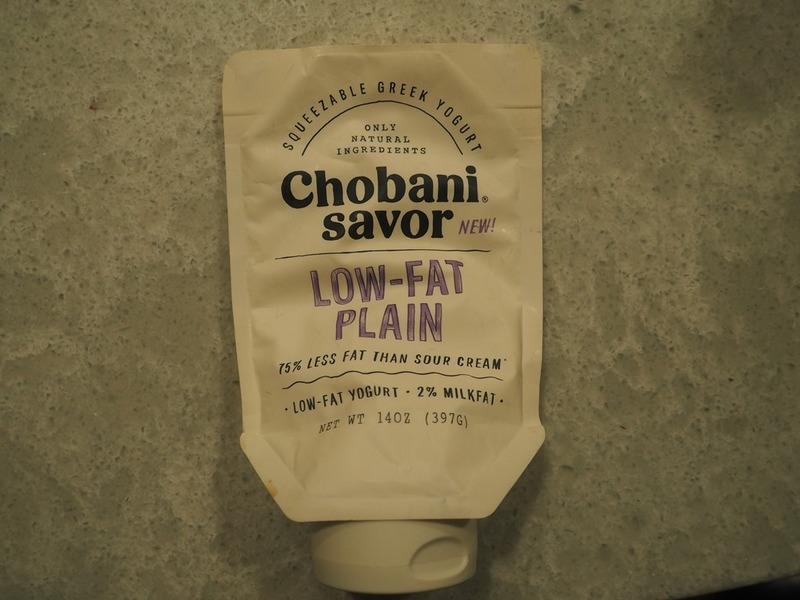 I have found the Chobani Savors as a replacement for sour cream. One of the lunches I had this week looks like this. 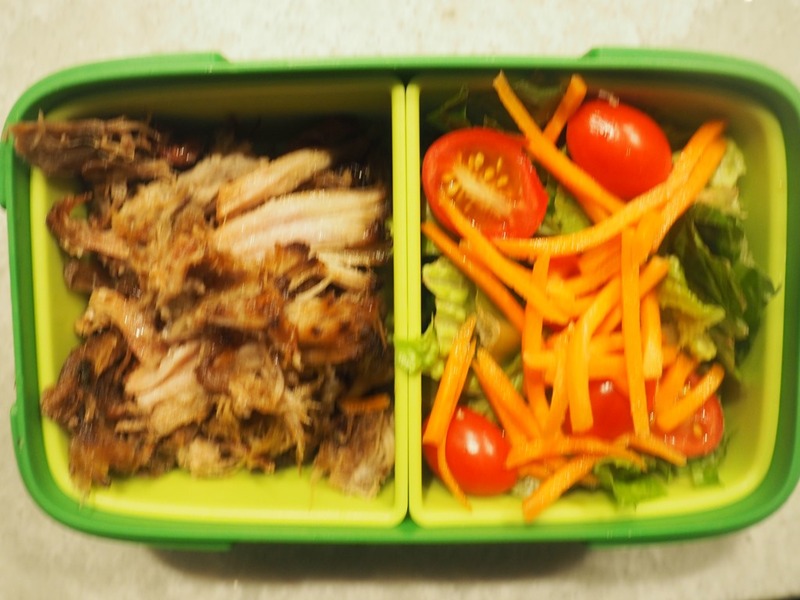 Pulled pork with a small side salad (I apologize for that picture, I don’t know why it came out fuzzy), coleslaw made with Chobani Savors, a little, little bit of mayonnaise, honey, apple cider vinegar, and dijon mustard; and of course my apple, orange and, because I found one this week, pineapple. 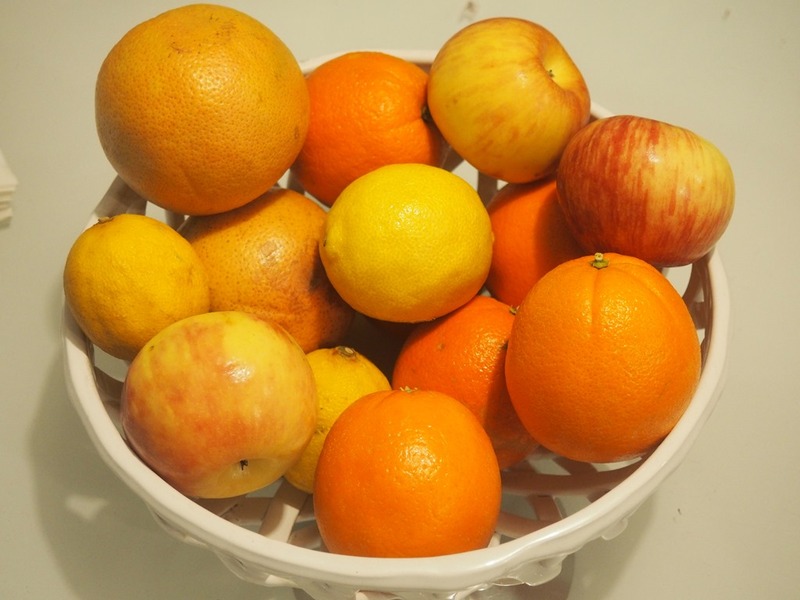 My fruit bowl is always full of grapefruit, lemons, apples and oranges. I have the lemons in my water and grapefruit for breakfast a few days a week. 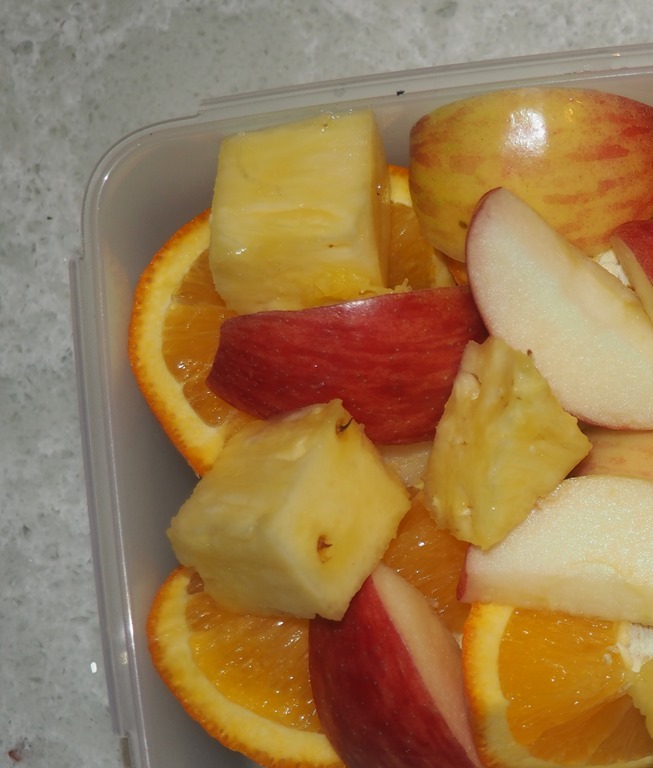 I try to have an apple (Honeycrisp, please) and orange each day for lunch. I add pineapple if I can find it at a great price. I think it was helpful over the holidays when Stan and Babydoll became sick with that sinus thing that is going around. Needless to say I have lost some weight – 23 lbs – and still need another 22 lbs before I get to my first goal weight. So Yay for me for losing the 23 lbs!!!! In addition to being a part of WW, our family joined the Y last September. We had been wanting to join the Y for a while, but we just couldn’t justify the cost at the time. This time, Stan and I were both on a mission to slim down, there was a new Y opening up near our home soon, and we found that my job had an employee discount offered for the Y. Babydoll has been wanting us to sign up, because she is a swimmer and most Y’s have pools (the location near us did not, but the new one was going to have it). Another thing that I had issue with was finding the time to go to the gym. My schedule is not conducive to me going to the gym after work; I have too much to do. Plus, by the time I get everything done, I just want to sit down; I do not want to go to a crowded gym and try to find a machine I can use – I have been advised by my Orthopedist to have no part of a treadmill with my knee being a contender for replacement. I took a careful look at my schedule and made a mental commitment to go 2 days a week as well as walking daily (even in cold weather). So now, I have three things that I have set a goal to be committed to – Weight Watchers, walking daily unless the weather is not conducive to it (rain, extreme temperatures, or ice would be the only deterrent because I am walking outside), and going to the gym at least 2 days a week. Then this year, I decided to add challenges. 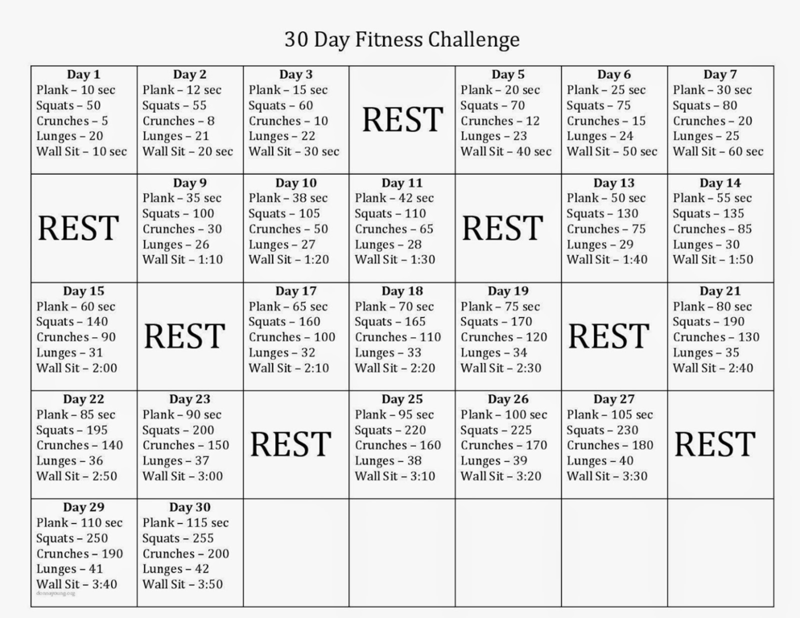 This month, me and Babydoll are doing a challenge that truly has been a test….it is a challenge. It’s basically the squats, crunches and wall sit that are taking us out. Oh, I hate the plank too. You know what, it is all bad. Next month, we are going to focus on ab and arm work, since they are the parts of my body I really want to have defined by the summer (another goal). I hope that I have articulated what my healthy body goal is: there are two goal weights, I want to have definition in my arms and abs, I want to commit to at least two days per week, and walking daily unless the weather is dangerous outside. I will tell you about my others goals (financial, spiritual, travel) in the weeks to come. Do you have a healthy body goal? Do you have a beginners challenge that you want to recommend? Is there a snack or dessert that is healthy you would recommend? Comment below, I would love to hear from you.